The Bible uses the phrase “second death” four times, all in the book of Revelation (Revelation 2:11, Revelation 20:6, Revelation 20:14, and Revelation 21:8). What does “second death” mean? Second death means simply to die a second time. This second dying involves the complete destruction of both body and soul (see Matthew 10:28). Second death means to remain alive forever while confined to hell in a state of unending conscious torment. I don’t like it when people set up straw men. So what comes next is my attempt to present the best argument in favor of the eternal torment interpretation of “the second death”. The argument really is not complex. 1. John’s vision of the devil, the beast, and the false prophet being tormented day and night for ever and ever is literal (by “literal” I mean non-figurative, non-symbolic, non-metaphoric). 2. What happens to the devil, the beast, and the false prophet will also happen to all the unsaved when they are thrown into the same lake of fire. 10 they, too, will drink the wine of God's fury, which has been poured full strength into the cup of his wrath. They will be tormented with burning sulfur in the presence of the holy angels and of the Lamb. 11 And the smoke of their torment will rise for ever and ever. There will be no rest day or night for those who worship the beast and its image, or for anyone who receives the mark of its name." 1. This is referring to the same thing as the lake of fire in Revelation 20. 2. The vision of smoke rising for ever and ever refers to literal everlasting torture. 3. The fate of all unsaved people is the same as the fate of those who receive the mark of the beast. If all of the above assumptions are correct, then Revelation 14 and 20 provide an extremely strong argument in favor of eternal conscious torment. When I was transitioning from belief in eternal torment to belief in annihilationism, all the other arguments for eternal torment appeared to be very weak. But these arguments from Revelation appeared strong. I took them seriously then, and I still do now. I no longer have any doubts about these passages. I am thoroughly convinced that the eternal torment interpretation of the “second death” is wrong. In the rest of this blog series I will share my reasons. The eternal torment view of the “second death” is based on the assumption that the visions of eternal torment in Revelation 14 and 20 should be interpreted literally. This assumption is wrong. 1. The virgin birth of Christ. 2. The miracles seen throughout the Bible. 3. The physical, bodily resurrection of Christ. By treating these literal truths as mere symbols, liberal theology undermined foundations of core gospel truths and did great damage to the gospel and the Church. As a conservative evangelical, I want to guard the precious literal truths that Christ was born of a virgin, that He did many astounding miracles which legitimize the claim that He is the Son of God, and that He really, physically, literally rose from the dead. But just because many parts of the Bible are literal does not mean all parts are literal. 1. In Pharaoh’s dream he sees cannibalistic cows eating other cows. The dream does not mean that some cows literally eat other cows (Genesis 41:20). We know this because the interpretation of the dream is given. 2. Jesus says , “I am the gate for the sheep” (John 10:7). We know He is not a literal gate because that would be absurd. 3. Jesus commands us, “if your eye causes you to stumble, pluck it out” (Matthew 9:47). Again, a literal interpretation is absurd and also inconsistent with the example of the rest of Scripture. 4. Jesus tells the woman at the well that “an hour” is coming when people will worship God in Spirit and in truth (John 4:23, see ESV which has the literal translation “hour”). Jesus did not mean that this new worship would last only one literal hour! Some parts of the Bible use more symbols and symbolic language than others. Historical narratives contain little symbolism. Teaching contains a little more. Poetry and teaching in the form of parables use still more symbols. But the most symbolic parts of the Bible are dreams and visions. The whole book of Revelation consists of highly symbolic visions! The fact that Revelation is a book which should be understood symbolically is not an idea originating from either annihilationists or liberal theologians. It is the widespread view of conservative, evangelical scholars who have studied the book in great detail. I recently read two excellent commentaries on Revelation which are highly regarded by conservative evangelicals. Both of the authors have a traditional view of hell. Although they differ on many specific interpretations and have somewhat different broad interpretative schemes, they both agree on the highly symbolic nature of Revelation. This should warn the reader not to expect a literal presentation of future history, but a symbolic portrayal of that which must yet take place. It is important for an adequate understanding of Revelation to remember that God is communicating his message by means of visions that are symbolic rather than literal. (Mounce, The Book of Revelation, Revised Edition, 1997, pg. 42). In this light the dictum of the popular approach to Revelation – “interpret literally unless you are forced to interpret symbolically” – should be turned on its head. Instead, the programmatic statement about the book’s precise mode of communication in 1:1 is that the warp and woof of it is symbolic, so that the preceding dictum should be reversed to say “interpret symbolically unless you are forced to interpret literally.” Better put, the reader is to expect that the main means of divine revelation in this book is symbolic. (Beale, Revelation, A Shorter Commentary, 2015, pg. 12). 1. The seven lampstands are not literal lampstands (Revelation 1:12). We know this because we are told the lampstands stand for seven churches (Revelation 1:20). 2. It is highly unlikely that there is a woman literally named Jezebel (Revelation 2:20) in the church at Thyatira. Her name symbolizes the fact that she is promoting idolatry and evil like the Jezebel of the Old Testament. 3. God is not going to turn faithful Christians in Philadelphia into literal pillars (Revelation 3:12). 4. Jesus does not literally have seven horns and seven eyes (Revelation 5:6). John really sees a lamb with seven horns and seven eyes IN HIS VISION and this lamb is Jesus, but this does NOT mean that Jesus really has seven eyes or seven horns (or any horns!!!). 5. In Revelation 6:13, in his vision, John sees stars falling from the sky to earth. This does not likely mean literal stars fall to the earth. In response to this, people hide in caves (Revelation 6:15). Really? If a single literal star fell to the earth would anyone be able to hide in a cave in response? John’s vision is full of symbolic things which do not literally happen. The vision is entirely true, but its true interpretation depends on us understanding its symbolic nature. 6. In Revelation 7:1, John sees four angels standing at “the four corners of the earth”. Does this prove the Bible is wrong since the earth does not literally have four corners? No! John is reporting what he sees in highly symbolic visions, not reporting what the earth literally looks like from space. IN HIS VISION the earth has four corners. It’s not meant to be literal. 7. In Revelation 10:10, John eats a scroll. In his vision he is actually eating it. That doesn’t mean that in real life John had to literally eat a scroll. It is symbolic and probably means something like internalizing the truth of God which he is to then speak to others. 8. In Revelation 12 John sees a seven headed dragon standing over a woman about to give birth. The dragon wants to eat the baby. This is shocking. The woman is given wings so she can escape from the dragon. There are many interpretations, but none of them are literal. 9. In Revelation 13 John sees two terrible beasts. In the vision he really sees these beasts, but that does not mean these beasts are literal creatures that some people will one day meet in real life. Part of the meaning of the beasts is given to John. They seem to represent the evil use of government power and the deception of false religion. The second beast seems to be identical to the “false prophet” in Revelation. 10. In Revelation 14, John sees “another angel” with a sharp sickle. He uses the sickle to “reap the earth”. This is not literal. John really sees this in his vision, but the reaping stands for God gathering all mankind to judgment. 12. In Revelation 18:8 we are told that plagues will overtake Babylon in “a single day”. But this time period is symbolic. How do we know? One of the plagues is “famine”. Now, if I didn’t eat for one whole day I might say, “I’m famished”, but of course I would not be speaking literally! Many more examples could be given. There are many different interpretations of Revelation, and in some cases there is disagreement over whether a particular part of John’s vision is literal or symbolic. But the examples above show that there are many parts of John’s vision which are widely understood by theologically conservative evangelical Christians as symbolic and not literal. John is specifically told what a part of his vision means, revealing that it was not literal. As I will explain, both of these reasons apply to the eternal torment seen in the lake of fire in Revelation 20. Eternal torment is absurd and ridiculous. And John is specifically told what the lake of fire means. First, we should recognize that the eternal torment which John saw in his visions in Revelation 14 and 20 is symbolic, not literal, because literal eternal torment would be absurd. God is perfectly represented by Jesus Christ in His character, actions, and teachings. Jesus commands us to love our enemies like our Heavenly Father does. 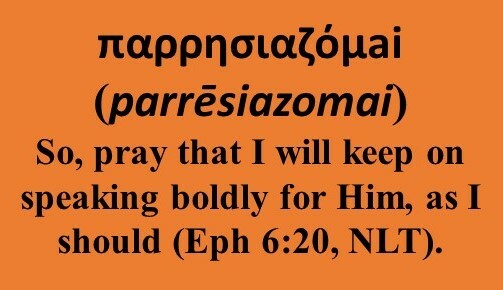 He prayed for those who were crucifying Him. And we are supposed to believe that He would torture those same enemies for billions of years and then keep going for billions more (for ever!)? If there is no hope of redemption (which is the case after final judgment), then annihilation is neither unjust nor unloving. But eternal torture? Absurd. Jesus does not literally have seven eyes, He is not going to turn his faithful followers in literal pillars, and He is not going to literally torture the unsaved forever and ever. While our feeling that eternal torment is absurd is correct, in part 5 I will give extensive Biblical evidence to show that our feeling is in line with what the Bible teaches and is in fact a part of our God given conscious. In addition to the fact that eternal torment would be absurd, there is even stronger evidence that eternal torment in the lake of fire is not literal. John tells us exactly what the lake of fire means. One of the main causes of the misinterpretation of “second death” by many Christians is that a key sentence in Revelation has been interpreted backwards. In the book of Revelation, John is largely reporting what he “saw” (Revelation 1:19, and over 50 uses of “see” or “saw” throughout the book). Included in what John saw in his vision are many strange things whose meanings are not immediately obvious. In some cases John does not give us a meaning for the things he sees. But at other times he gives very explicit and simple meanings. When these helpful meanings are examined, a consistent pattern emerges. Let’s look at three easy to understand examples from Revelation, and then compare these to “the second death”. In this first example, John actually does see, in his vision, golden bowls full of incense. But the incense is symbolic. We know this because John explicitly tells us the meaning. Notice also how crazy it would be to interpret Revelation 5:8 backwards. A backwards interpretation would say that the true meaning of prayer is incense. Then, whenever we read about prayer in the rest of the Bible, we would wrongly assume that prayer did not mean talking to God, but rather prayer meant burning incense. And when we went to obey the commands of the Bible to be devoted to prayer, we would buy and burn some incense. That would be ridiculous, and thankfully no one has made this mistake. Example #2: “Fine linen stands for the righteous acts of God’s holy people” (Rev 19:8b). In this second example, John hears that the bride of Christ will wear bright and clean fine linen. He is also told that the fine linen is a symbol. This does not mean that we will not actually wear fine linen in Heaven. Perhaps we will. But the main point is that this fine linen is a symbol of the righteous acts of God’s people. How terrible (and silly) it would be if someone read a verse like Matthew 5:16 and then, based on Revelation 19:8, thought Jesus was teaching us that it was important to wear fine linen for others to see and glorify God. That would be backwards. Righteous acts do not mean wearing fine linen. Rather, wearing fine linen in John’s vision was a symbol for righteous acts. Example 3: “The waters you saw . . . are peoples, multitudes, nations and languages” (Rev 17:15). In Revelation 17:1, John is shown a prostitute sitting on (or by) “waters”. In his vision I have no doubt that he saw “waters”. But the waters stand for peoples, multitudes, nations, and languages. Perhaps you think “waters” is a strange symbol for groups of people. But since the Bible explicitly tells us that the waters stand for nations and languages, it must be true. The three examples above are not difficult to understand. So, hopefully you will be able to see the very inconsistent way in which many Christians (including myself in the past!) have wrongly interpreted the lake of fire. They say that “death” does not mean what we normally think of as “death”. Indeed, the traditional view is that the unsaved NEVER actually die. Instead they live forever in the lake of fire. Hopefully by now you can see that this is backwards. What the Bible actually says is that the lake of fire which John saw in his vision is a symbol for dying a second time. On the one hand, I feel like the evidence already presented in part 1 of this series should be enough to settle the meaning of second death. The pattern of how symbols in John’s visions are defined is actually quite clear and simple. On the other hand, I am well aware that the traditional interpretation of “second death” as eternal torment is deeply ingrained and wide spread among Bible believing Christians. Also, I am well aware of traditional counterarguments. 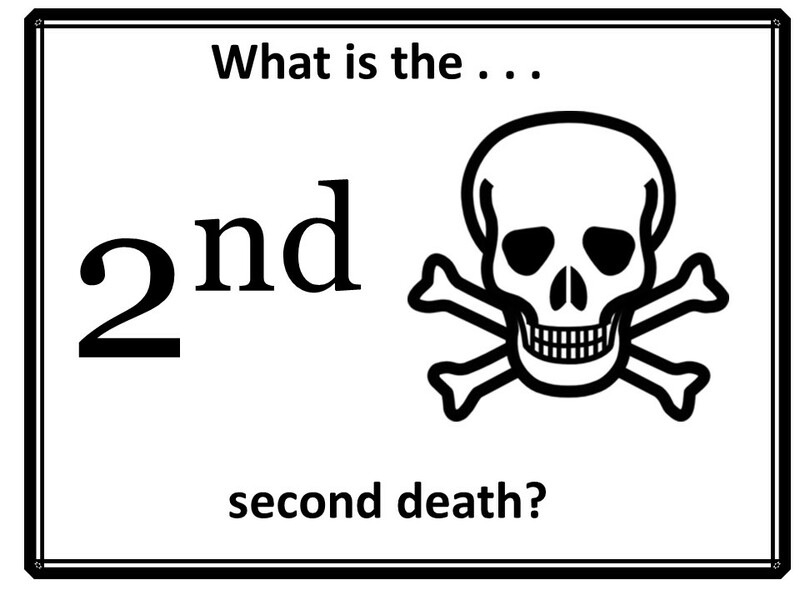 So I believe it is best to present more evidence that “second death” literally means “to die a second time”. Thankfully, there is a LOT more evidence, as I hope you will see in the following posts. note: I plan to add links as each part is posted. In this post, we have looked at the use of symbols in Revelation. We have seen how the traditional view of eternal torment is a result of interpreting a symbol backwards. In part two we will consider the different meanings, literal and metaphorical, of “death” in the Bible. 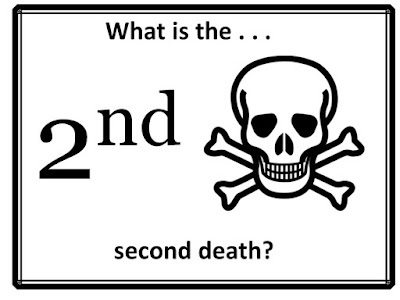 We will then examine evidence to decide which of these meanings is present in the phrase “second death”. Because the phrase “second death” is explaining John’s vision of a lake of fire, we will look at the use of fire for judgment throughout the Bible. We will see that God uses fire to consume His enemies. Here we will discuss how to best interpret the only two phrases in the Bible which contain the idea of eternal torment. We will look at a massive sea of blood which John sees in his vision as an example of hyperbolic metaphor being used to describe terrible judgment. In part 5 we will look at the God-given principle of proportional punishment. We will see how this principle provides Biblical confirmation of our “gut feeling” that eternal torment is absurd and should be interpreted as hyperbolic metaphor. This is a (very condensed) look at what the whole rest of the Bible says about the final fate of the ungodly. The Bible is always harmonious when correctly understood. 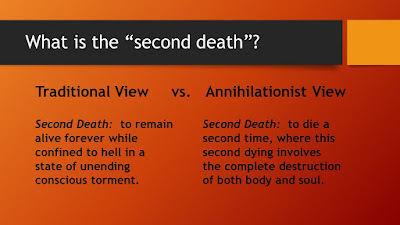 We will see how the whole Bible provides the strong evidence for the annihilationist understanding of “second death”. Why is all this important? Why spend time and energy on trying to correct a deeply entrenched traditional interpretation? We find the answer in the Lord’s Prayer and in visions of glorious worship. Interesting stuff. I'm more neoorthodox than evangelical and one thing they did well was define terms. I personally think if we are discussing "eternal" damnation the distinction needs to be held between "eternal" a untreated attribute of God and "forever" a subjective experience of a creation, time. If that distinction holds, and I think it does the second death can be eternal without having infinite temporal duration. It is eternal in that God does it in finality of who he is, at some level, his divinity is shown in who he condemns. Thus that death is now/not yet as salvation and fits that whole cryptic, "to the one who has not what they have is taken away." But I'm also comfortable there as a "would be supra lapsarian if I thought its understanding of time works" double predestinationist. Most annihilationists, including myself, understand that annihilation IS an eternal punishment. We understand "eternal" in the plain sense of literally lasting forever. This is because once God completely and utterly destroys the unrighteous, they remain dead forever. They will never, for all eternity, enjoy the loving presence of God and His gracious rich rewards and the perfect New Heavens and New Earth. Hope this helps.